as flowing is still one of the black arts; for the same amount of time and money it is equally easy to make more power, make less power, or make no difference. The secret is a narrow path between engineering, art and magic. Airflow is what the engine uses to make power. Give it more air and it will make more power – or, to be more precise, it will make more torque – something which you demonstrate every time you open the throttle. In the quest for more power it is obviously essential to increase gas flow as much as possible but, in addition to the throttle valve, there is another, more obstructive valve in the way. So gas flow around this obstruction is critical; the shape of the port an valve and the way in which the valve is lifted can all have serious effects on the engine’s final performance. It seems strange, then, that the act of “gas flowing” is one of the more contentious areas of engine tuning. All too often, engines have been (expensively) “gas flowed” and there has been no noticeable effect. The biggest change in performance is likely to be due to the owner’s wallet being that much lighter. There are several reasons why this might be. First anyone can do it (or try to) and there is a strong chance that they will make no real difference or could even make things worse. This is because the manufacturers tend to be fairly good at it themselves and usually the ports do not need improving. In standard trim, Japanese engines tend to have plenty of valve/port area and will stand a hefty performance increase before the cylinder head becomes the limiting factor. It follows that something else is more restrictive (perhaps the exhaust or the carburettors) and while this is the case, no amount of porting will persuade the engine to give more power. When the engine has been tuned it may be necessary to increase the intake area (and possible the exhaust as well, although this is usually less critical). What skilful gas flowing can do is improve on the power delivery through the midrange and beyond peak power. It can do this because the way in which gas flows past the valve can produce swirl or turbulence; the direction in which the gas swirls can increase the tendency for fresh gas to be lost into the exhaust when both valves are open during the top overlap period. The speed and direction of the gas can help scavenge the cylinder. Swirl in the gas can also affect combustion – for better or worse. Finally, at very high engine speed, there is a very short time interval for gas to flow into the cylinder, and any improvement in gas flow must help; it will show because the power won’t drop so quickly after it has peaked. Japanese engines tend not to have very much valve overlap, so any scavenging effects are minimised. Where engines have very small valves they can be opened more quickly without over-stressing the valve train, so the necessary time-area can be achieved just by using pretty violent cams. This is part of the reason that four-and five-valve heads are so popular. Bigger valves are heavier and – for a given level of stress – cannot be accelerated so quickly. Therefore to get the required time-area they have to be opened earlier and closed later; big two-valve engines, like the Manx Norton, had enormous valve duration and lots of overlap which destroyed midrange power. 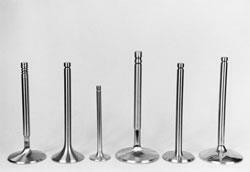 Using the same reasoning a 500cc, four-valve single would need longer cam duration than a 1000cc, four-valve four and would therefore be more sensitive to gas flowing. This raises the question: what is gas flowing? The ultimate test of whether on engine flows more than another is whether it produces more torque at the same speed. Which isn’t much help when you’re sitting at the bend with the head in front of you and your recently-acquired Diprofil high speed grinder in one hand and a pair of Vernier calipers in the other. There is equipment for measuring gas flow – a flow rig – but the results can be inconsistent and misleading. It is important for the operator to understand what he is doing and to interpret the results with some care. Paul Ivey, at Race Engine Components, uses a Superflow 110 to some effect. 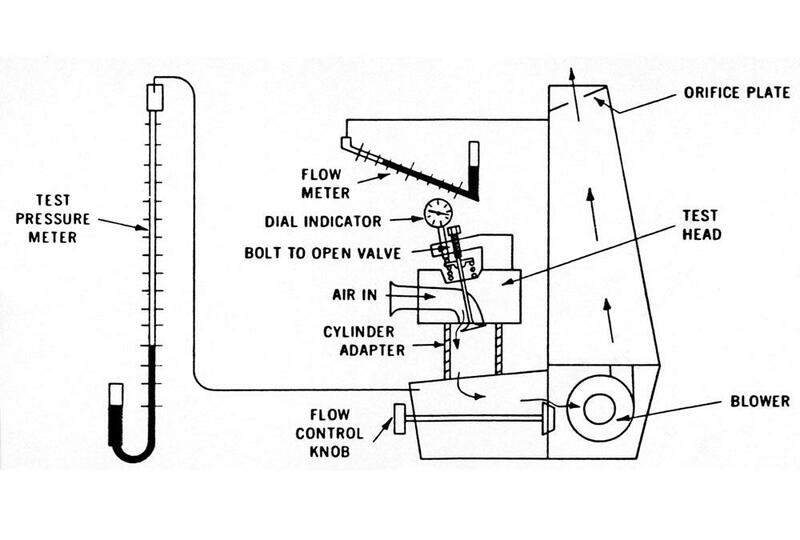 The way the rig works is shown in the diagram: a pump pulls air through the head and passes it out through a standard orifice. Water manometers compare the pressure drop across the head with the pressure drop across the orifice (various sizes of orifice can be used). The purpose of the standard orifice is that the air flow through it (in cubic feet per minute) is known and can be looked up from charts relating the flow to the pressure reading. It’s a bit more complicated than that, because it has to be corrected for temperature. 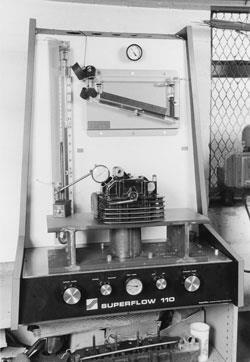 To allow the flow rig to make sense, it is necessary to operate it at the same order of pressure which happens inside the engine. There are various schools of through about this; Paul adopts the 10 inches of water method, adjusting the control valve until there is a pressure drop of 10 inches of water across the valve. One major difference between flow rigs and real engines is that rigs run at a steady flow while engines pulsate. So the rig can – at best – only act as a comparator. It tells you nothing about the behaviour of the gas when its velocity is low, or when it is at peak velocity and it gives no indication of the effects that pressure waves might have as they charge up and down the intake tract. The test itself is quite simple, once the rig has reached a steady state. The valve is opened a certain amount (measured by a dial indicator) the pressure drop adjusted and the orifice pressure (and temperature) readings taken. These are later translated into flow readings. The process is repeated in steps until the valve is fully opened. This is then repeated with the modified head, bigger valve or whatever. Unless you have an implicit faith in correction factors, it is better to do the tests under the same conditions so that air density changes do not enter into the calculations. In the end you should be able to see whether one set-up can flow more gas than another. It’s easy to fool yourself, though. Paul is careful to keep certain factors constant – like the length and shape of the entry to the port. It is in detail like this that the operator’s skill, knowledge and experience make the difference between consistent results and total gibberish. Paul also makes valves, for a variety of car and bike engines, as well as doing development work. He used to concentrate on building race engines but now the emphasis is on head and valve work and, to give you an idea of his current credentials, he is responsible for the valves, ports and intake stubs in Vernon Glashier’s very rapid 500 Honda single. He uses a stainless steel – 214N – for all his valves because it has good strength when hot. It has two disadvantages; first it needs to be run in bronze guides (which Paul is going to start making) or the valve stems need to be chromed in order to use cast iron guides. Second, it doesn’t tolerate being bent, even minor dings cannot be straightened – sometimes the straightening effect of being pulled back on to its seat is enough to set up a fatigue failure. This kind of breakage has given the material an unwarranted bad name (“the heads come off”) while the real reason is that the rider has missed a gear or otherwise over-revved the motor. The valve itself is a major obstruction to air flow. After all, that is its job during the time that it spends in the closed position. But when it is open, it would be nice to be able to reduce this obstruction to the absolute minimum. Consequently the shape of the valve is important; more than that, its shape is important in relation to the shape of the port and the way the valve seat fits into the design of the head. There probably are rules to follow, but those who know them won’t tell. The trouble is that those who don’t know them won’t (can’t) tell either, and the whole thing adds up to a cloudy mystique in which the gullible are quickly parted from their money. By keeping their secrets, the good air flow engineers make it easy for the cowboy operators to continue their business. It’s tempting to say that you should judge by the results on the track but even this isn’t a completely reliable guide. All tuners, good and bad, discover that there is a lot to be said for employing a quick rider – and there are riders who can win races on practically any engine, good or bad. The first, and only obvious, rule is that the port needs to be as straight and as large as possible. What is not so obvious is that where there is a corner, the port needs to narrow in order to prevent turbulence and it also needs to be smooth in the sense that sudden steps can cause all kinds of havoc in the gas flow. How big these steps have to be before they have any effect, is debatable; many people take it to the logical conclusion that a smooth, polished finish is necessary. The answer is that it can’t do any harm, except to your bank balance, but the optimum surface is probably not far removed from the stock, cast finish found in most Japanese production heads. Paul makes a knowing comment that the half inch before the seat and the area immediately beyond is as important as the rest of the tract put together. In fact some designers specify intricate seat profiles – based on a 45 degree seat, but trimmed back with multi-angle cutters until the seat is virtually line contact with a profile curving away from the valve. Again, the only way you can test this quickly is on a flow rig and the only proof is what the engine then does on the dyno. Some idea of the efficiency of the tract can be seen by running a flow test for different amounts of valve lift. The diagram shows the effect, taken from Glashier’s 500 in standard trim, after gas flowing and then with a bigger valve. The general result is that as the valve is opened, air flow increases more or less linearly. Then, quite suddenly, the air flow stays at a constant level – at this point the valve is no longer restricting the passage of air and, as far as the engine is concerned there is no point in lifting it any further. So this test immediately tells us how much lift the cam has to provide. Usually the air flow reaches a maximum when the valve lift is roughly 0.25 times the valve diameter. In a port which flows well this could be higher, up to 0.30 x diameter. The 500 Honda demonstrates this quite well; on the Superflow rig. It reaches a flow of nearly 106 cu ft/min (CFM) at a lift which corresponds to 0.25 x valve diameter. After the port was gas flowed by Paul Ivey, the air flow went up to 132 CFM – at the same time, but now the point where maximum flow/lift occurs is much more clearly defined. Then Paul fitted a bigger valve and the flow went up to 155 CFM before it showed signs of reaching a saturation point. For this arrangement to work to its full potential it would be necessary to use a cam which lifted the valve that extra 0.05 inch over what the stock valve needed. There is an increase there of about 50 per cent, but only at full lift. The difference at half lift is only 17 per cent. The other thing that flow testing can show is that sometimes it is necessary to put material back into the port, rather than machine it away. Plasticine is often used to mould a new shape on top of the existing material – which is quick and convenient for the flow test but which doesn’t help to produce new valves or cast new cylinder heads. There are many shapes of port and, as the diagrams show, there are many different types of valve. The only guaranteed way to make the engine flow more gas is to try all of them, moulding different shapes with plasticine on a basic penny-on-a-stick type of valve and playing about with port shapes until something is found which gives the best performance. To finish the job, this shape has to be duplicated on a real engine which then has to be run on a dynamometer. Even then a great deal of common sense (which is a lot harder than you might suspect) has to be applied because if the rest of the engine isn’t matched to the port and valve area then the changes simply won’t show up. There are practical considerations as well, such as the compatibility of materials between valve and guide, which was mentioned already. Another point is in the shape of the groove which takes the split collet. This part of the valve is subject to extreme fatigue loading and a shape with square edges will raise the stress considerably more than one with round edges. The Americans are very good at producing apt expressions. There may be something else they are good at which will be revealed in the fullness of time (itself a fairly good expression, if a bit over-worked). However, to get back to the point, the Americans say things like: power is where you find it. As power is directly proportional to gas flow and as this expression applies completely to gas flow, what else can we say? Air flow is where you find it. The trick is in looking in the right place.